Dragonball Kart is a very cute and entertaining racing game. In the game, you will encounter the very familiar characters of Dragonball such as Son Go Ku, Picollo, Vegeta, Mr Satan and you will also see the "image" of the game Mario in Dragonball Kart. 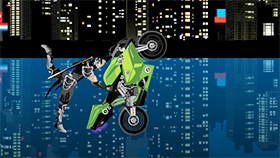 After selecting the character, you will enter the race with the remaining 3 opponents. 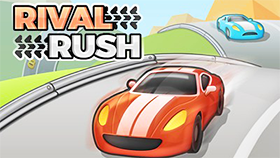 Your task is to control your car and reach the finish line in each race. The system will base on the ranking to calculate the points for the players. The fun part is that the terrain will have stone blocks in the way and the squares with question marks are very similar to Mario. When you hit these squares, you will have the chance to get the items. You can use these items to make it difficult for your opponent. In addition, the game features "Special skill" very interesting. When the energy bar is full, you can activate this special ability to "immobilize" the opponent for a few seconds. However, the main task of this game is to collect all 7 dragon balls in the races. Use up arrow key to jump. Use right arrow key to move. Use space to active Special Skill. Use enter to active items. Based on the ranking you will be graded. Dragonballs will appear randomly in squares with question marks.